For this Start-Up Feature, we will be interviewing Evangeline, Founder of GetKobe. Hello! What’s your current role in your startup, and how did your past experiences take you here? With almost 10 years of experience in embracing digital marketing, I was the Business Director in PurpleClick, driving PurpleClick’s online advertising business from a 3-man startup to a hyper-growth today, a 60-man regional company across Southeast Asia. I have experience in building high performance teams in Sales, Account Management and Operations, spearheading successful business development projects such as UOB-PurpleClick collaboration, Parkway-Google Digital Session, ProClick™ Automation System, Salesforce ERP implementation, Modus Operandi across regional teams and achieved accelerated business performance and strong employee morale simultaneously. I have the honor of working with great organizations such as Redbull, Volvo, Harley Davidson, and businesses from all sectors, and all sizes across all kinds of online advertising products including PPC advertising, SEM, SEO, Display, Remarketing on platforms such as Google, Yahoo, Baidu, YouTube, Facebook and LinkedIn. With my multi faced digital marketing experience in precision and performance, I’ve witnessed the huge gap in social content marketing. Social content, or otherwise Social “Word of Mouth” is a highly effective marketing tool that has helped propel businesses success since the beginning of time. Today, with the power of data, tracking and digital – I have come up with my own proprietary algorithm that can deliver performance driven influencer marketing. 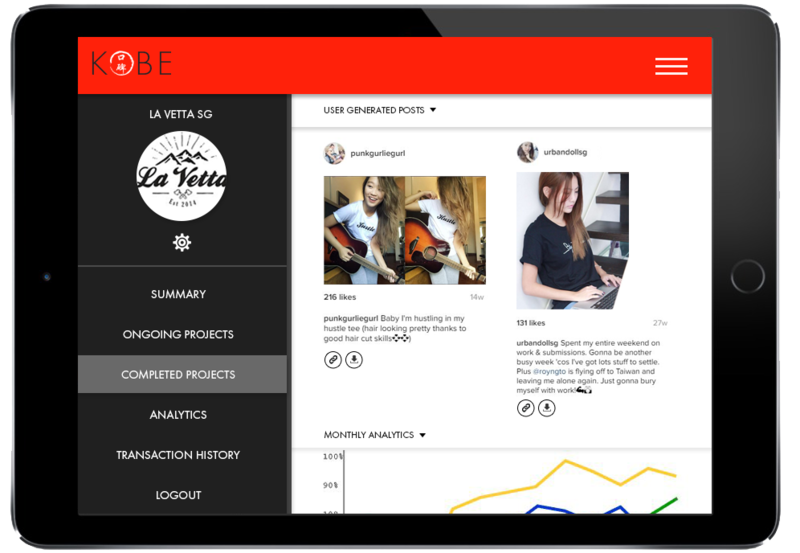 Kobe is a self-serve social media influencer platform agnostic to social media publishers, which matches influencers’ social posts to respective businesses. More than just a commission earning platform, Kobe has a patented algorithm that allows businesses to pay for real customer impact (not influencers’ popularity) – by deep social data analytics and smart aggregation. Providing full transparency and 100% control to businesses in a simple to use and intuitive platform, Kobe revolutionizes social influence for all businesses, especially the SMEs. Our ecosystem simultaneously allows influencers to keep their freedom and originality on social media as we fiercely defend their interests. Kobe aims to revive the social influence scene with its performance driven foundation, unleashing the full potential of social content. With a deep understanding of the digital, branding, advertising, content and social landscape – coupled with the hustler charisma and extensive experience of building a high performance team using scalable infrastructure, processes and systems – I am confident that my role in Kobe Global Technologies as the CEO will take this startup into rising unicorn in the future years. Which 3 words would describe you best? Magnet – I’m a natural human magnet and the saying goes to describe, “I can charm a bird down from the tree” in an old-school way. I can grasp easily what people think, that makes me a natural sales person without appearing too salesy. From leading a team, to pursuing sales, working with colleagues or trying to hire someone – people are often drawn to my inspiring and magnetic charisma. I’ve got no problems attracting, retaining talent. Grit – I’ve been in PurpleClick when we grew the team from 3 to 20, and within a month dropped to 7 people in a mass exodus due to market conditions and careless expansion. The recovery period took 2 years, with customers complaining and leaving, team morale at the lowest and numbers looking the worse. It takes more than usual ‘passion’ to get through the stage where everyone lost faith. I’ve got a proven track record of grit and ability to undergo high degrees of stress while still retaining unwavering faith in self and in the vision. Hitler – I mean being a Hitler to myself, what were you thinking about? J I have extremely high expectations and slap myself really hard – giving extreme expectations. An example will be – an average deal size someone closed ranged around $5,000 but when I brought in $100k deals – I thought, “How can I do more?” Well, that’s how hard I push myself, and somehow it comes naturally! How did you come up with the idea? And what problem is your startup trying to solve? I identified a huge problem in the social content industry. It was a wonderful industry that billions of SMEs depended on as a means to survival however still relying in outdated processes to deliver fulfillment. The gap resulted in SMEs losing means to this powerful tool and I felt compelled to step out and plug this gap. What are your preferred platforms/tools? Have you gotten any interesting feedback from users of the app/solution? I’ve got a really high hit rate – people always believed in the power of having someone else sell you, rather than constantly selling yourself. Which means – having someone like a social influencer endorsing you rather than having advertisements all the time. Only thing is, advertising can be controlled and tracked. The more you spend, the better results you can get. Influencer marketing however is a great platform, but not so measurable. When I (with a reputation for data-driven performance marketing who never liked fluffy branding) said I was going to make influencer marketing performance-driven, everyone sat up and gave me the strong vote of faith without asking anything else. That drove me further to make this platform an astounding success. Another funny one – a lot of people asked if I was selling beef! Well, company name’s taken from the ancient Chinese way of saying “word of mouth” so I thought it was pretty tongue-in-cheek but it ended up with a funny misunderstanding. Well, it gradually became a nice conversation opener in the end whenever I meet someone new. How do you keep yourself motivated, especially during the low times? I have a secret about my socks. My socks always come in cute cartoons like the minions, mickey-mouse or something close to that. I take off my shoes to let my feet talk to each other when I’m low! Like if I always step on that poor minion but they still feel alright – who am I to be upset? See low is always relative – same as when things are at its peak. There’s never a low too low, and never a high too high. If you could go back in time when you first started, what would you have done differently? I would have slept for 2 years without waking up before I decide to do this – that is, if sleep can be ‘stored’! Haha! Going into Malaysia, Indonesia, Philippines and Hong Kong. I’ve cut some deals for social content and have secured good interest. What’s one advice you would give to budding entrepreneurs? Please do not start your own startup. If you’re looking for corporate freedom by starting your own startup, do not walk down this path. If you’re starting a startup just because of the glorious fables of million-dollar exits, do not start your own startup. If you are looking for fame and bragging rights, my advice is for you to wake up, head back to that cubicle, and get to work. Start it only if you’re ready for the hours of hard work, grueling pain, insults and setbacks. Knowing that regardless of it all, that you are still going to do it. You need to possess contagious courage and unwavering insanity to walk a route that could potentially land nowhere, or make the world a better place. Find out more about GetKobe! I was at the PurpleClick Traning on 23rd June and heard Evangeline’s presentation. I would like to get in touch with her to discuss collaboration. Please contact me at email above or call 65339144.